Good Morning Green Panda Friends. For today’s post in our Credit Card Management series I wanted to review the famous American Express Black Credit Card. However, I couldn’t find any information on the American Express website about this infamous card, which is better known for its famous card carriers and limitless spending ability. Since I couldn’t find any information about the American Express Black Card, I decided to discuss the myths that I have heard about this mysterious Credit Card from television shows, music videos, and other general myths that I have heard while working in the financial services industry. As there is no way for me to confirm the information I have heard, read, and seen, the information will remain as myths instead of facts. 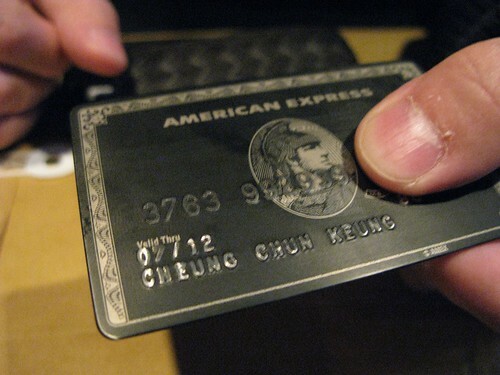 What have you heard about the American Express Black Card? Myth # 1 – Kim Zolciak, the reality star of The Real Housewives of Atlanta, said that cardholders are required to spend a minimum of $100,000 per year on the American Express Black Card. Myth # 2 – After a Google search I read on Love to Know Credit Cards that the American Express Black Card is also known as the American Express Centurion Credit Card. Myth # 3 – Wikipedia says that the American Express Black card was created in 1999 and the benefits to cardholders depend on the country of origin. Myth # 4 – A general bank myth is that cardholders are offered the American Express Black Card by invitation only. Myth # 5 – The rapper Fabolous refers to the American Express Black Card as the “throw it in the bag” card which implies it doesn’t have a spending limit. Myth # 6 – Another general bank myth is that the American Express Black card offers cardholders a private concierge service to run errands and make purchases for them, as long as they are paying with their American Express card. As I was hopelessly browsing through the American Express Website and searching for information on the American Express Black Card I found several interesting facts about American Express and their Credit Cards. What Do You Know About American Express? Fact # 1 – The American Express website is very user friendly. American Express is socially active on YouTube, Face Book, and Twitter. They also post links to their latest advertisements. There is an American Express application for the iPhone called the Social Currency app. Fact # 2 – American Express is the world’s largest card issuer by purchase volume. There are 87.9 million cards currently in force, and they have $620 billion in annual purchase volume. Fact # 3 – American Express cardholders spend four times more than MasterCard users and three and a half times more than Visa cardholders. Fact # 4 – American Express offers PASS from American Express which is a Prepaid Credit Card. Fact # 5 – American Express has several different partners with whom they offer rewards programs. American Express partners include Jet Blue Airlines, Delta Airlines, Hilton Hotels, and The Starwood Hotel Family. Fact # 6 – American Express does not offer Student Credit Cards for College Students. However, they do recommend the Blue from American Express Card or the Zync from American Express Card if you are a student.